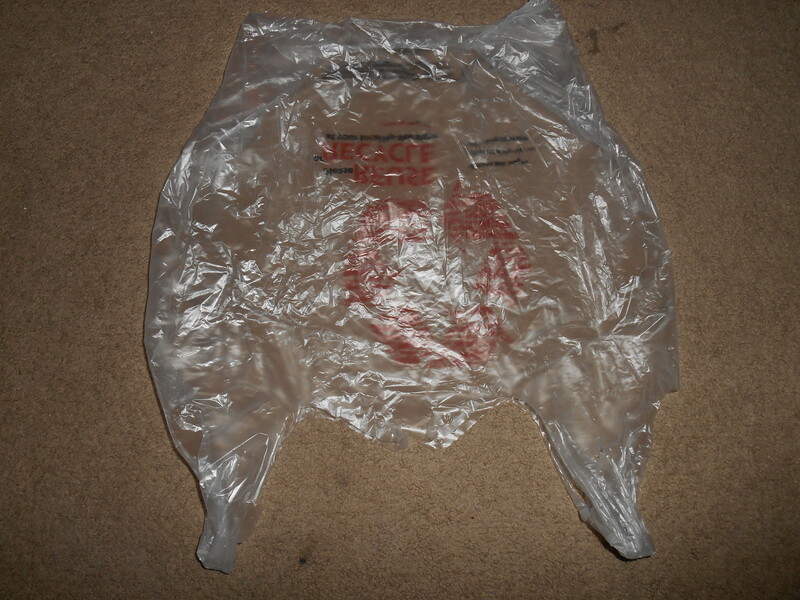 I know, this topic (storing plastic bags) has been done and done again. I’ve tried a few different methods of corralling them, but I have my own criteria as well. I use reusable cloth bags for every *planned* grocery store trip. Sometimes though, I get caught without them and while I use paper sacks sometimes, I do like to collect some plastic shopping bags. They can come in handy. I don’t reuse bags that have had something wet in it – whether it was milk that had condensation on the outside, or meat that leaked blood – I will throw those bags away. I check the bags for holes before storing them. If there is a hole, big or small, I can recycle it at the store. I use different sized bags for different purposes. 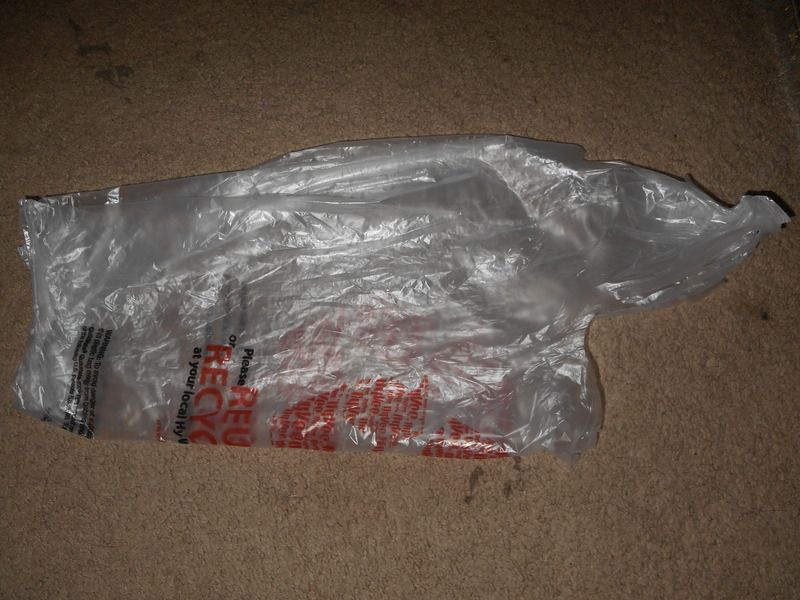 Most of my “regular” sized bags go on to become trash can liners in my house, or to pick up after my dog when we take walks. In my house, I like to use those sturdy Target bags for the bathroom trash. They are taller than the grocery store bags, and the bathroom trash tends to be “grosser” than the other trash cans in the house. I change my bathroom trash bag every week for trash day, whereas other bags in the house, which might have only had paper products, might just get dumped and the bag remains for another week. The first thing I tried was to corral the bags in an empty tissue box. This one was so cute I’d kept it on display for a while, waiting for a way to upcycle it. This was my chance! It was a little difficult to get just one bag out, and I worried about any bugs getting in. Also, as you can see, the box was starting to rip on the corners. When I tried the cleaning wipes container to store bags, I was really excited. 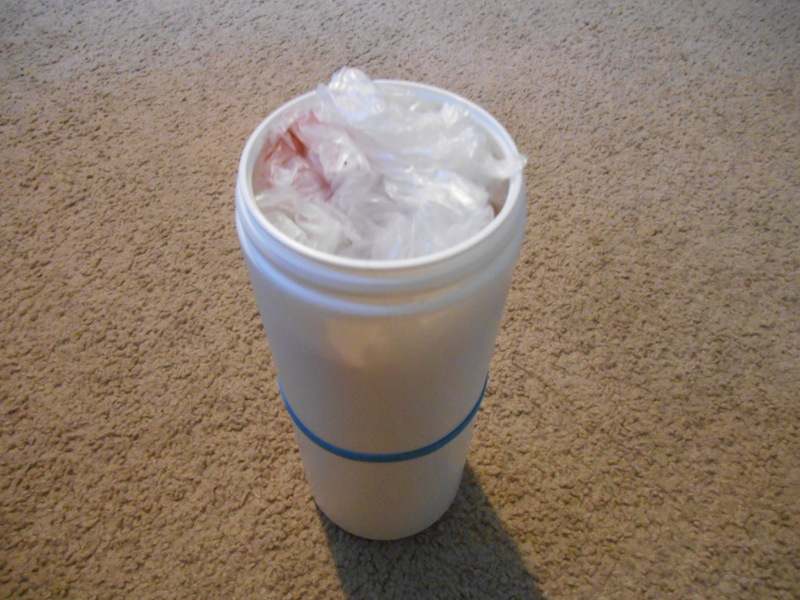 It worked great!… Until I got more bags to add and the container still had a bunch inside. I ended up with a container in use, and a bunch of random bags under the kitchen sink anyway, waiting to be put away. Once I had them all rolled up, I held them all together vertically so they were the same heights. Then I put them all into the empty container at the same time. I REALLY had to squeeze all the air out! Now I can get them out easily, and add more easily. I do have to take off the entire lid rather than just pop it open – but that’s not difficult. I will say that the container is crammed full and I can’t imagine trying to stuff another in right now, so I would probably recycle any bags I got while the container is so full I can’t add more. The rubber band around the base is in case I want to keep more bags in a rubber band for any reason. 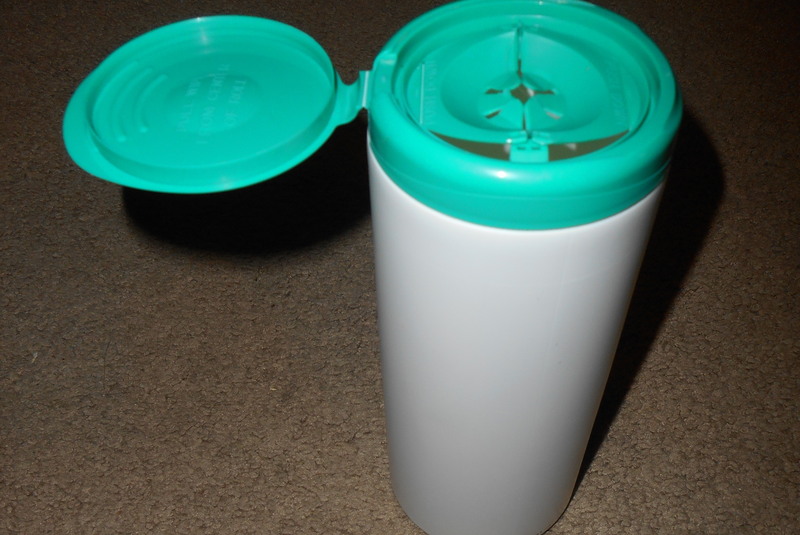 You’ll notice the Target bags are not in this container – because I use them differently. All the Target bags are rolled up together in another Target bag, and under the bathroom sink, as that is where I use them. 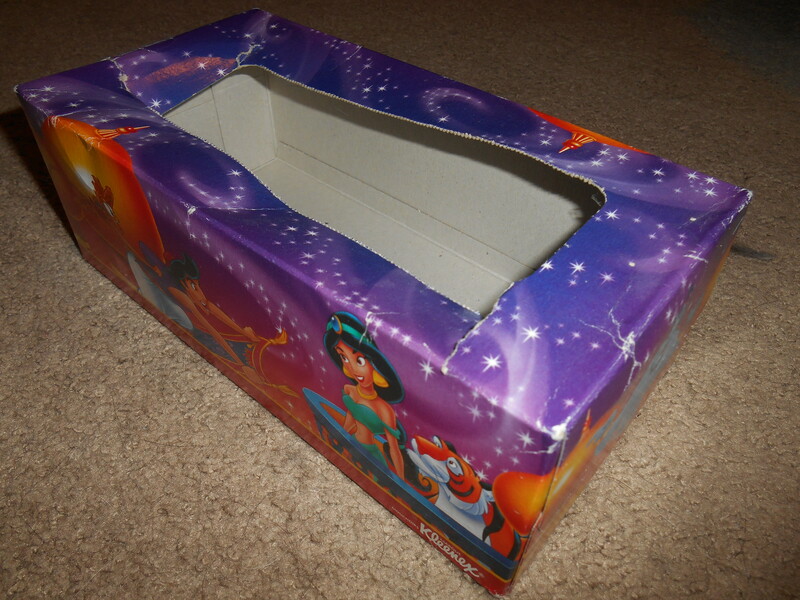 Now… what to do with that Aladdin tissue box? 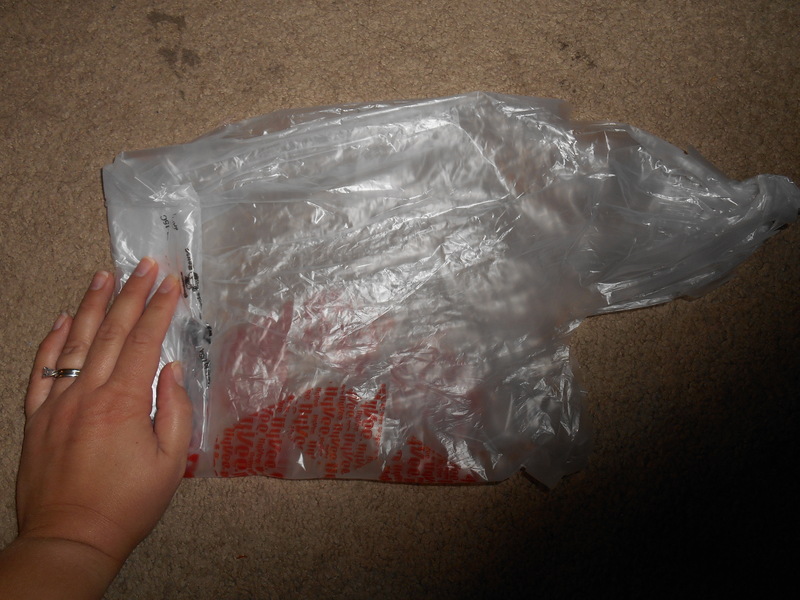 This entry was posted in Cleaning, How-To, Organization and tagged cleaning, how-to, organization, plastic bag, storage, storing plastic bags, tissue box, wipes container. Bookmark the permalink.